Thirty-five credited combat missions flown by 1Lt Marvin H. Heckendorf: 258 (17 Oct 1944), 260, 261, 262, 263, 265, 268, 269, 270, 271, 272, 273, 274, 275, 277, 279, 280, 281, 283, 284, 285, 287, 290, 292, 295, 298B, 299, 300, 302, 304, 309, 310, 312, 313, 314 (14 Feb 1945). For Mission dates, targets and Mission Reports, see Combat Missions. 1Lt Marvin H. Heckendorf (P) - All missions flown as First Pilot. First Mission (258) flown with an experienced CoPilot. Completed his 35 mission combat tour on 14 Feb 1945 (Mission 314). 1Lt Robert L. Erickson (CP) - Flew on 25 missions with 1Lt Heckendorf (260, 261 ,262 263, 265, 269, 270, 271, 272, 273, 274, 275, 277, 279, 280, 281, 283, 294, 285, 287, 292, 295, 299, 300, 304), six missions with other Pilots (266, 289, 293, 297, 298B, 301). Was upgraded from CoPilot to Pilot on orders dated 7 Jan 1945 and flew four missions as a First Pilot (309, 310, 311, 312). Substitute CoPilots used by the 1Lt Heckendorf Crew on 10 missions (258, 268, 290, 298B, 302, 309, 310, 312, 313, 314). 1Lt Kenneth R. Carnahan (N) - Flew on 12 missions with 1Lt Heckendorf (258, 260, 261, 262, 263, 265, 268, 269, 270, 271, 272, 273) and 11 missions with other Pilots: With a regular combat crew Pilot (264); As a PFF Lead Crew Navigator with Bomb Groups as indicated (285 (303BG), 287 (303BG), 289 ( ? BG), 291A (91 BG), 292 (303BG), 295A 451 BG), 297 ( ? BG), 298A (92 BG), 299 (303 BG), 301 (381 BG), 316 (303BG). 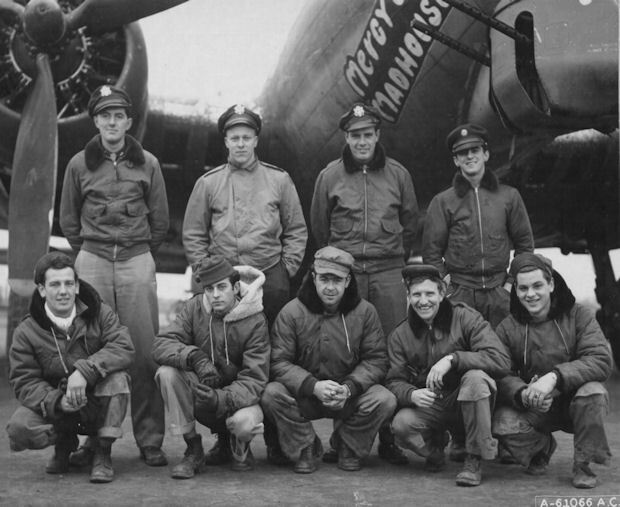 Was a member of a 91st BG(H) PFF Lead Crew Squadron for an unknown period of time. May have flown additional missions while on temporary duty with the 91st BG(H). Completed 23 known combat missions on 16 Feb 1945 (mission 316). S/Sgt Robert J. Weaver (TOG) - Flew on 26 combat missions with 1Lt Heckendorf (268, 269, 270, 271, 272, 273, 274, 275, 277, 279, 280, 284, 285, 287, 290, 292, 295, 298B, 299, 300, 302, 304, 309, 310, 313, 314) and ten missions with other Pilots: As Togglier (262, 281, 283, 298, 301, 303, 315); As BTG (260, 261, 263). Completed combat tour (36 missions) on 15 Feb 1945 (mission 315). T/Sgt Hubert W. Gallman (E), T/Sgt Bill Windle (R), S/Sgt Robert L. Barris (BTG), S/Sgt Raymond W. Lary (WG) and S/Sgt David M. Koerner (TG). Flew on all of the 35 1Lt Heckendorf missions. Completed 35 mission combat tours on 14 Feb 1945 (mission 314).